A famille rose porcelain paperweight of brick form. The top surface is enamelled with buildings in a landscape setting, with jagged mountains, various kinds of trees and floating clouds filling up the scene. The upper left corner has a fourteen-character inscription. There are eight further smaller characters at the end of the poem, reading “ding hai nian chun zuo yu zhu shan (made at Zhushan in the Spring of Dinghai year). The ends of the paperweight are carved in openwork with a double-coin pattern. The paperweight is covered overall in a thin transparent glaze, leaving only the base unglazed and revealing the porcelain body of slightly buff colour with firing marks. 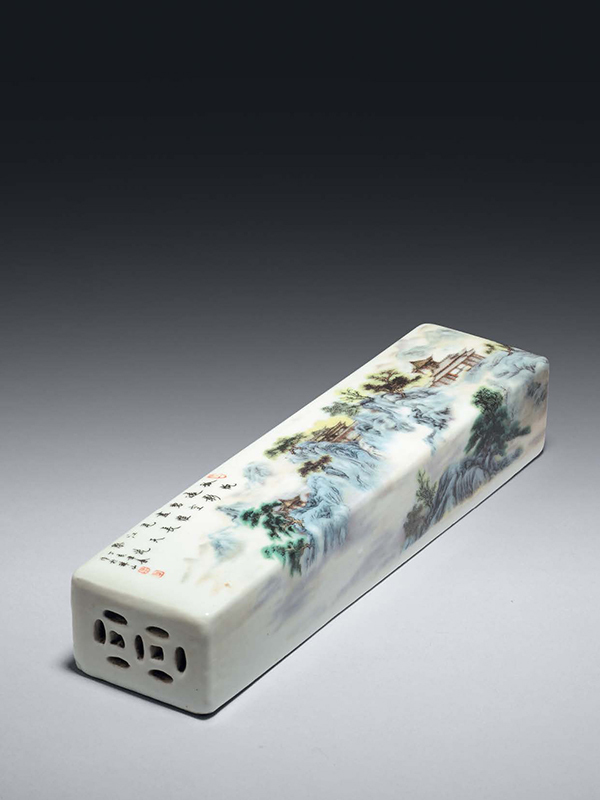 The inscription on this charming porcelain paperweight comes from a famous poem Seeing Meng Haoran Off from the Yellow Crane Tower (Huanherou song Meng Haoran zhi Guanglin) written by Li Bai (701 – 762). The whole poem is composed of twenty-eight characters in four lines, and the inscription written on this paperweight are the third and fourth lines of the poem. The translation of the whole poem is: At the Yellow Crane Tower in the west my old friend says farewell; in the mist the flowers of spring he goes down to Yangzhou; lone sail disappears down the edge of the azure sky; all I see is the Yangtze river rolling toward the horizon. The landscape setting decorated on this piece echoes the content of the poem.